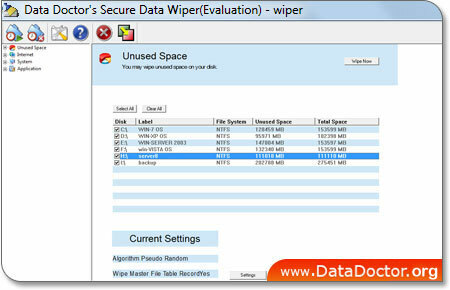 Secure data wiper is an advanced data erasure tool fully capable to wipes entire hard disk drive partition, selected files and folders, unused disk space and deletes records of your offline/online internet activities such as History folders, cookies, URL list, internet files temp folders and eliminates passwords from PC drives and safeguard your computer privacy. The software works in Non-destructive wiping and destructive wiping (recommended for advance users). Non-destructive wiping wipes deleted files and folders that improve the overall speed and performance of the computer. Destructive wiping wipes entire or selected disk area sector range regardless of data saved in that sector range. Eliminate deleted system files including administrator temporary file, clipboard contents, system registry traces, Windows event log etc. Delete most recently used application of Microsoft office documents including word, Power point, Excel, Access data records and similar applications. Delete private records of your internet explorer such as temporary files, typed URL, history, cookies and free up your disk space. Wipes out multiple files and folders completely. Easiest and the fastest data erasure tool.